Free Lunch Society is a documentary being featured in the excellent Transitions Film Festival 2018. 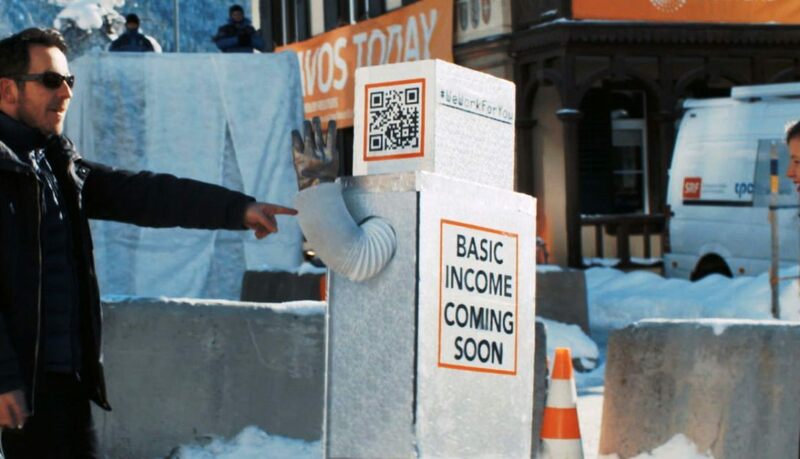 The basic premise of the documentary centres on giving public funds to everyone as an unconditional basic income. Does this universal human right, with no service required in return, seem strange to you? Is it a visionary reform programme or a romantic leftist, socialist utopia? The idea is gaining steam and has been trialled in several countries. This documentary details the spread of the idea. Ronald Reagan famously said, "There is no such thing as a free lunch." Free Lunch Society, written and directed by Christian Tod, challenges that idea. The film calls on experts such as Warren Buffet - one of the richest men in the world, Martin Luther King and other civil rights activists, Patrick Stewart from Star Trek and even The Simpsons. Radical as it may be, being paid to be alive is not, surprisingly, a new idea. Is it the obvious solution to poverty that could change the world with its bold simplicity? The history of the idea is explored in this 90-minute film. There have been many trials in the USA and around the world. There was an Alaska model which guaranteed annual income after the 1969 oil industry struck it rich and everyone in the state got a yearly cheque. San Francisco has a worker-owned solar energy company. Peter Barnes, entrepreneur and economist, describes the deep flaws of capitalism. He asserts that the land, water and air belong to everyone and wealth should belong to every person. One of the biggest social experiments was in Manitoba. There were also projects in New Jersey, Seattle and Denver in the 1960s. Ronald Reagan's experiments were called off and never evaluated. Richard Nixon's Family Assistance Plan saw no decline in worker effort - on the contrary, worker effort actually increased as people were free to pursue self-fulfilling jobs. The freedom is removing the fear: If I don't work, I don't eat. Elsewhere, there was a Canadian social experiment in the City of Dauphin and the "Mincome" project in Winnipeg. Namibia, which has the most uneven distribution of wealth in the world, had a pilot project. Basel in Switzerland has introduced similar methods. Inequality is seen as a bad thing in Europe but not so much in the USA. For example, in New York, many people still believe "greed is good". It has become clear that big business has hijacked western democracy. The proponents of a basic income declare that it is the redistribution of power rather than money. Is it madness or altruism? E.g. Wikipedia proved that sharing the knowledge for free can work. Germany has introduced a "private lottery" to give power and security, so that people can pursue their innermost dreams and become entrepreneurs. What would you do if you had a guaranteed basic income? Would you continue to work? Would you use the windfall as seed money to start your own business, like some of the recipients in Africa? It is a similar proposition to: would you still work if you won the lottery? I'll give the last word to Woody Allen who said, "Money is better than poverty, if only for financial reasons." Adelaide at Mercury Cinema, 18-27 May. Please see programme for times. Why? To find out what we should do with all the money.